In-mold decoration is a process developed to provide product designers and original equipment manufacturers (OEMs) with an alternative method for decorating their plastic products. The process involves placing a decorated thin film plastic into an injection mold and then injecting plastic either behind or on top of the film. When the mold opens the part is decorated and the graphics are imbedded in the part. Before in-mold decoration, plastic parts were decorated with labels, spray painting, pad printing, screen printing and laser etching. All these decoration processes were applied to the first surface of the molded part. As a result, over time the decoration wears off. In addition to poor decoration life, post-mold decoration is an inefficient non-lean process. More recently IMD has evolved to include functionality as well as graphics. Hytech equipment, tooling and know how is being used to assist companies to develop next generation in-mold electronics (IME) parts. In-mold electronics includes such functions as shielding, sensing, capacitive switching, and lighting. 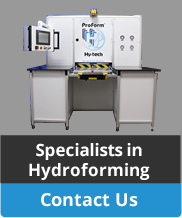 The Hytech AccuForm® high pressure forming process is the ideal forming method for in-molded electronics. This new technology offers OEMs the ability to reduce weight and cost while improving aesthetics, customer satisfaction and reliability. The four processes required for IMD are printing, forming, trimming and molding. Hytech focuses on forming and cutting technology for IMD. The patented Hytech AccuForm® process was developed to provide accurate and repeatable registered graphics even on the most complex geometries. Contact us or call 602-944-1526, to see if IMD is the right choice for your application.